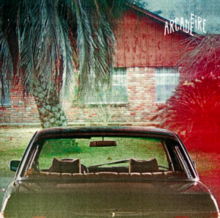 City with No Children was the 4th single to be released from the Arcade Fire album The Suburbs. It failed to chart almost everywhere, except in Belgium where it reached No 24. It remind's me of another song but I just can't remember what??? It reminds me of late 80s early 90s U2...I can't place a song though. I know what you mean. And it is now going to drive me crazy too. I will let you know if I think of something. Kinda reminds me of Coldplay meets a slowed down The Black Keys. Can't mention a song it reminds me of, but I blame those chords for that.